Literally at the very last minute, while our truck, hitched to the trailer, was warming up in the driveway, I decided to take Eddie hunting instead of Charlie. Charlie felt a little funny to me yesterday, nothing I could put my finger on, and since I had the option to take Eddie, I went with it. 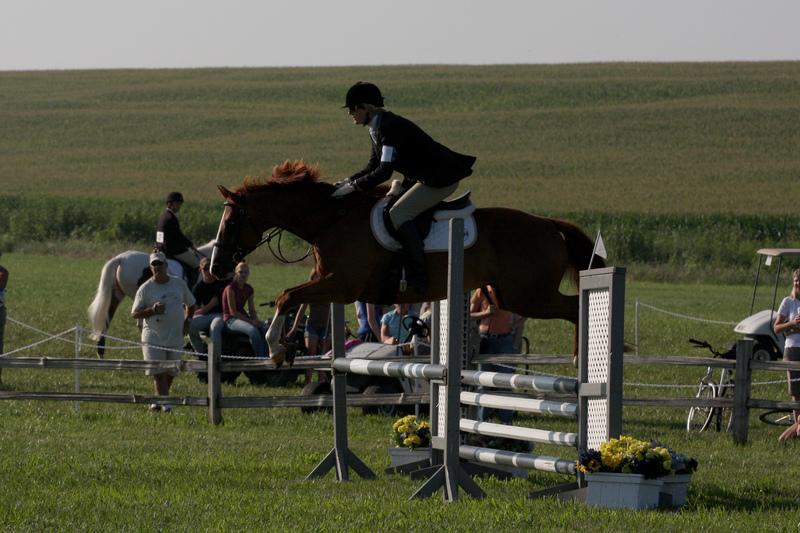 Eddie’s had a difficult month and I thought having some fun on a foxhunting weekend might be just what the doctor ordered. Jay’s ride for the weekend, in a paddock at the Rodeo Grounds in Burwell, NE, home of Iowa’s biggest rodeo. The dazzling extravagance of pipe fences around a weedy sandlot would be home for the weekend. They were cool with it. They rolled in the sand and got weeds in their manes and tails, grinning and exclaiming that they were now Real Rodeo Horses. Perfect, we’ve arrived. 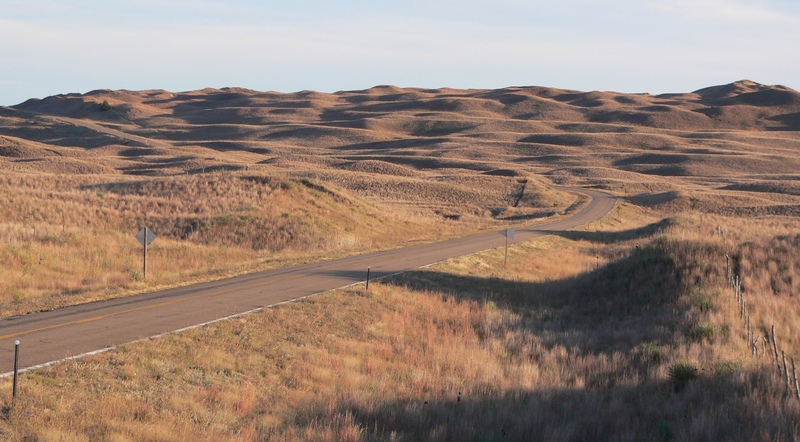 The sandhills of northern NE are basically an ancient desert, dunes now held in place by a sparse grass exoskeleton. 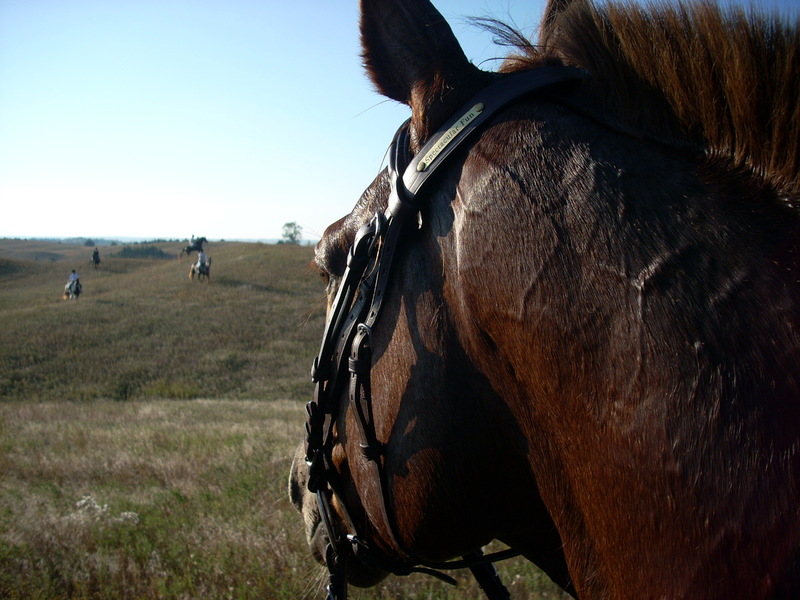 The sandhills are a fantasy land for riding horses. Most landowners own vast stretches in the area because, with the sparse grass, that is what it takes to run cattle, the primary interest of the ranchers in the area. If you get permission to ride the ground of 3 or 4 ranchers, you have a day’s trot to get from one end to the other. But you won’t be able to do it, because this is the sandhills, and they aren’t just whistling dixie about that. 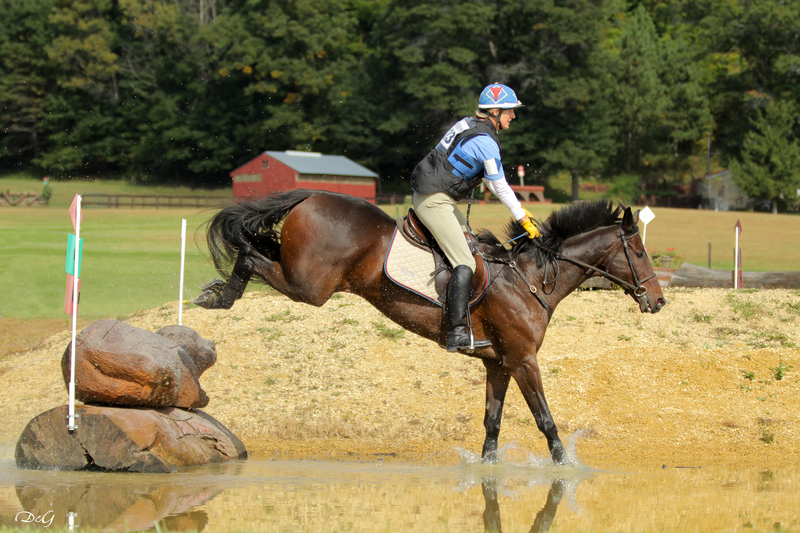 If you wanted to put some condition on yourself and your event horse, a week or two out here would do it. In Eddie’s work at home, we have been focusing on suppleness and elasticity, both laterally and longitudinally. 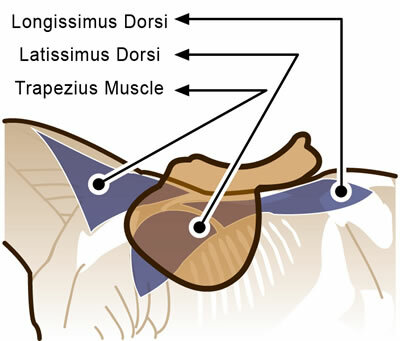 Job One, though, is longitudinal – over his topline. His busy thoroughbred brain has him always thinking, analyzing, wondering, hoping, commenting and more. He’s a chattering squirrel of mental activity. He translates this wealth of drama into his body. He stores it at the base of his neck, which he raises and tightens and then very cleverly squeezes it with the strength of a python out through his poll. He has then become Rock Hard Monster Horsie. Monster Horsie never uses this power for evil, but what would happen if he could use all that drama-muscle for good? This was my experiment for the weekend then, to see if Monster Horsie energy could be harnessed for better movement or more suppleness or perhaps powering a small city. I want to make it clear that I had a great time hunting. I watched hound work, I rode beautiful country, I managed to be useful to the hunt a time or two when asked and I chatted with friends at appropriate moments. But, in the same manner that a computer can run one program in the foreground and another in the background as we work, Eddie’s longitudinal suppleness was always running in the background of my mind. As we trotted out to the fixture in the morning, I focused on elastic contact. When he (predictably) tightened his poll, lifted his neck and dropped his back, I kept my leg on, kept the contact and waited him out until he relaxed the muscles that were causing him to go inverted. He relaxed. It lasted about 2 seconds. He tightened, so I kept my leg on, let the contact passively resist until he softened, and then I immediately focused on being elastic again. Yay, it lasted 3 seconds. Lather, rinse, repeat for two hours. Sometimes the softening of his topline would last for 2 minutes, sometimes it would last for 4 seconds. It was not a linear process by any stretch of the imagination. I consciously avoided attaching any significance to the length of time he stayed loose over his topline. Any proper step from him was welcome and any tightening was passively-resisted without assigning judgement or emotion to it. I doubt anyone in the hunt field knew (or cared, they were hunting after all!) about the conversation Eddie and I were having. He felt taller, and lighter on his feet. In the best moments, I reveled in the power surging from his hocks across the live wire of the longissimus dorsi of his back under the saddle. A live trampoline had been placed where once a tight hammock had been. Sometimes a riding breakthrough occurs when I look very carefully at a problem with full attention, and work diligently to fix it. Sometimes I have been the benefactor of some wisdom from a particularly insightful instructor, a good book or article, or thoughtful judge. But sometimes, like finding a faint constellation in the night sky, the solution reveals itself when I don’t strive to find it, but rather use my peripheral vision, wait, and allow it to appear. “Seems easier to push than to let go and trust, but it’s alright.” Indigo Girls, It’s Alright.